From Manual of Mythology, by Alexander S. Murray; Revised Edition, Philadelphia: David McKay, Publisher, 1895; pp. 74-81. Fig. 10. — Pluto and Proserpina. We have seen how Zeus, Hera, and Poseidon came to be conceived as the three great deities who between them controlled the elements of heavens, sky, and sea, and how a character came to be ascribed to each of them such as was most naturally suggested by the phenomena of the provinces of the world in which they respectively ruled. But there still remained a region which could not escape the observation of people like the Greeks, gifted with so keen a sense of the various operations of nature. That region was, however, itself invisible, being under the surface of the earth. The growth of vegetation was seen to be steadily upward, as if 75 impelled by some divine force below. The metals which experience showed to be most precious to mankind could only be obtained by digging into that dark region under the earth. Thither returned, after its day on earth was spent, every form of life. In conceiving a god who should be supreme in the management of this region, it was necessary to attribute a double character to him: first, as the source of all the treasures and wealth of the earth, as expressed in his name Pluton (Pluto); and secondly, as monarch of the dark realm inhabited by the invisible shades of the dead, as expressed in his name of Aïdes (or Hades). While by virtue of his power of giving fertility to vegetation, of swelling the seed cast into the furrows of the earth, and of yielding treasures of precious metal, he was justly viewed as a benevolent deity and a true friend of man, yet there was another and very grim side to his character, in which he appears as the implacable, relentless god, whom no cost of sacrifice could persuade to permit any one ever to return who had once passed his gates. For this reason, to die, to go to Hades’ house, to pass out of sight, to be lost in the darkness of the lower world, was looked forward to as the dismal inevitable fate awaiting all men. Yet there must have been some consolation in the belief that the life thus claimed by him had been originally his gift, and that the means of comfort and pleasure in this life came from his hand. In later times, when the benevolent side of his character came more into view, assuring hopes arose concerning a future happy life that robbed death of its terrors. To impart such hopes was the purpose of the Eleusinian Mysteries. The myth concerning his marriage with Persephonē probably originated in trying to explain this union of two such opposite powers in the person of one god, Hades being the god of the dead while Persephonē was the personification of young blooming life. It was said that the grim god of the dead carried off by force a young goddess full of life. But no new life issued from the marriage. Yet she loved him, it would seem; for when her mother, Demeter (Ceres), implored her to come back to earth, her answer was that she had accepted from her husband the half of a pomegranate, or apple of love as it was called, and had eaten it. It is apparently in reference to this that both Hades and Persephonē are represented in works of art holding each a fruit. With regard to the region where the realm of Hades was to be looked for we find the ancient authorities at variance, some representing it as in the under-world proper — that is, under the crust of the earth, others in the remote west, in Oceanus, where were the gloomy groves of Persephonē. It was entered from the upper world by any spot of sufficiently sombre or wild natural aspect, particularly chasms with dark waters such as inspire terror. The most celebrated place of this kind was Lake Avernus, at Cumæ in Italy, of which it was said, as of the Dead Sea, that no bird tried to fly across it but fell lifeless in its waters. Beyond these entrances was an open gate through which all comers had to pass, and having passed could not as a rule retrace their steps. Exceptions 77 to the rules were made in favor of heroes such as Heracles [Hercules] and Orpheus, who were permitted to visit the home and the dead and return alive. The entrance was guarded by the dog of Hades, the dreaded Cerberus, a monster with three heads and a serpent’s tail, fawning on those who entered, but showing his horrible teeth to those who tried to pass out. But besides by this gateway, the lower was separated from the upper world by rivers with impetuous torrents, of which the most famous was the Styx, a stream of such terrible aspect that even the highest gods invoked it as witness of the truth of their oaths. Across this river the departed were conveyed by an aged ferryman appointed by the gods, and called Charon, but not until their bodies had been buried in the earth above with all due ceremony of sacrifice and marks of affection. Till this was done, the souls of the departed had to wander listlessly about the farther bank of the Styx, a prospect which was greatly dreaded by the ancients. For the ferry Charon exacted a toll ( naulon), to pay which a piece of money ( danake) was placed in the mouth of the dead at burial. The other rivers of the under-world were named Achĕron, that is, the river of “eternal woe”; Pyriphlĕgethon, the stream of “fire”; and Cocȳtus, the river of “weeping and wailing.” To these is added, by a later myth, Lethē, the river of “forgetfulness” — so called because its waters were believed to possess the property of causing the departed who drank of them to forget altogether their former circumstances in the upper world. The purport of this myth was to explain and establish the idea that the dead could not take with them into the realm of everlasting peace the consciousness of the 78 pains and sorrows of their lot on earth. In the waters of Lethē they drank a happy oblivion of all past suffering, wants and troubles, — an idea of the means of forgetting sorrow which later poets have made frequent use of. In the last book of the Odyssey, the souls of the slain suitors, conceived as small winged beings, are described as being conducted to the realm of Hades by Hermes in his capacity of Psychopompus. The way is dark and gloomy. They pass the streams of Oceanus, the white rock, the gates of Helios, the people of dreams, and at last reach the Asphodel meadow, where the spirits of the dead inhabit subterraneous caves. With regard to the condition of the dead under the dominion of Hades, the belief was that they led a shadowy sort 79 of apparent life, in which, as mere reflections of their former selves, they continued as in a dream, at any rate without distinct consciousness, to perform the labors and carry on the occupations to which they had been accustomed on earth. It was only to favored individuals like the Theban seer, Teiresias, of whom we have more to say hereafter, that the privilege of complete consciousness was granted. Such was the sad condition of the dead; and how they bore it may be guessed from the complaint of Achilles to Odysseus (Ulysses), in the Odyssey: “I would rather toil as a day-laborer on the earth than reign here a prince of dead multitudes.” Occasionally the shades of the dead were permitted to appear to their friends on earth. It was also possible to summon them by a sacrifice, the blood of which, when drunk by the spirits, restored to them consciousness and speech, and enabled them to communicate with the living. We must, however, clearly distinguish between this underworld as the abiding-place of the great mass of the dead, and two other regions where spirits of the departed were to be found, — the one Elysium (the Elysian Fields), with the islands of the blest, and the other Tartarus. The former region was most commonly placed in the remotest west, and the latter as far below the earth as the heavens are above it. In early times it appears to have been believed that Elysium and the happy islands were reserved less for the virtuous and good than for certain favorites of the gods. There, under the sovereignty of Cronus, they lived again a kind of second golden age of perpetual duration. 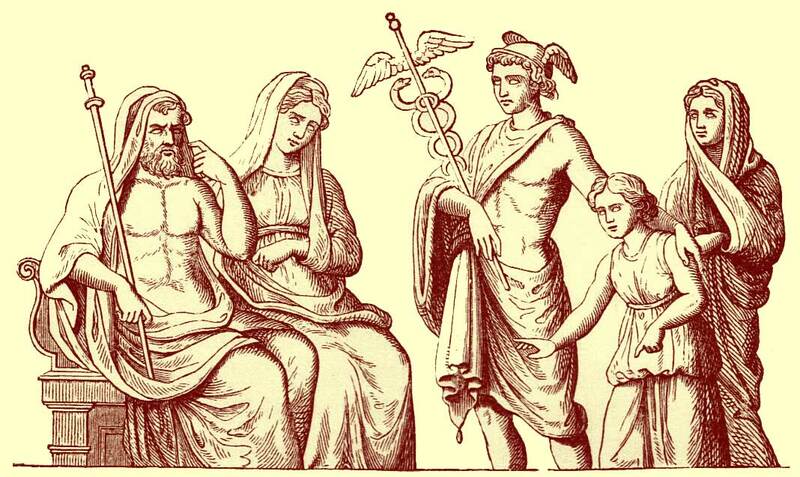 But in later times there spread more and more the belief in a happy immortality reserved for all the good, and particularly for those who had been initiated into the Eleusinian Mysteries (see below). Tartarus, on the other hand, was the region where those were condemned to punishment who had committed any 80 crime against the gods while on earth. What was the misery of their condition we shall be able to judge from the following account of a few of the best known of those condemned to such punishment, — as Tantalus, Ixion, Sisyphus, Tityus, and the Danaïdes. Tantalus, once a king of Phrygia, had given offence to the gods by his overbearing and treacherous conduct, as well as by the cruelty which he had practised on his own son. For this he was doomed to Tartarus, there to suffer from an unceasing dread of being crushed by a great rock that hung above his head, he the while standing up to the throat in water, yet possessed of a terrible thirst which he could never quench, and a gnawing hunger which he tried in vain to allay with the tempting fruits that hung over his head but withdrew at every approach he made. Ixion, once a sovereign of Thessaly, had, like Tantalus, outraged the gods, and was in consequence sentenced to Tartarus, there to be lashed with serpents to a wheel which a strong wind drove continually round and round. Sisyphus, once a king of Corinth, had by treachery and hostility incurred the anger of the gods in a high degree, and was punished in Tartarus by having to roll a huge stone up a height, which he had no sooner done, by means of his utmost exertion, than it rolled down again. Danaïdes, daughters of Danaus, king of Argos (of whom see below), were sentenced to Tartarus for the murder of their husbands. The punishment prescribed for them was to carry water and continued to pour it into a broken cistern or vase, the labor being all in vain, and going on for ever. Hades (Pluto) and Persephone (Proserpina), however, were not only rulers over the souls of the departed, but were also believed to exercise the function of judges of mankind after death. In this task they were assisted by three heroes who while on earth had been conspicuous for wisdom and justice, — Minos, Rhadamanthus, and Æcus, the last being. also, apart from this, the gate-keeper of the lower region, according to a later opinion. Both among the Greeks and Romans the worship of Pluton-Hades was widespread, and the honors paid him great. In Greece his principal temples were at Pylos, Athens, and Olympia in Elis. The cypress, narcissus, and boxwood were sacred to him. In Rome a great festival was held in his honor in the month of February, at which sacrifices (februationes) of black bulls and goats were offered, and the officiating priests wore wreaths of cypress, the whole ceremony extending over twelve nights. The Sæcular Games, which were held once in a century, were in his honor, and were celebrated as a tribute to the dead. In works of art Hades is represented as having inherited the same type of face as his brothers Zeus and Poseidon, differing only in a certain grimness of expressions. His hair shades his brow in heavy masses. In attitude he is either seated on a throne with Persephone by his side (as in Fig. 10), or standing in a chariot and carrying her off. His attributes are a sceptre like that of Zeus, and a helmet, which, like the cloud cap of Siegfried in German mythology, made its wearer invisible. His attendant is the three-headed dog Cerberus. On the painted vases scenes of torment in Tartarus are not unfrequent — such, for example, as the Danaïdes pouring water into the broken vase, or Ixion bound to the wheel, or Sisyphus pushing up the stone: Heracles carrying off Cerberus, and Orpheus on his memorable visit to bring back Eurydice, are also represented on the vases.